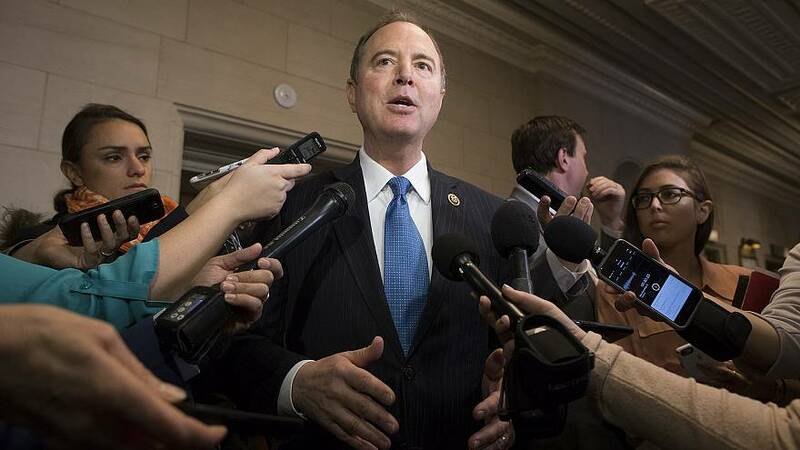 NBC's Mike Memoli delves into the rivalry between Trump and Adam Schiff. Border security talks have broken down just days before a new shutdown deadline. One of us(!) writes about how Trump's rhetoric on the border is different than the reality on the ground. Gavin Newsom is ordering National Guard troops back from the border. It sure looks like Robert Mueller is honing in on conversations between Paul Manafort and Konstantin Kilimnik. Millions of Americans are realizing their tax refunds are shrinking. Rep. Walter Jones has died. Ralph Northam's early life offers some clues about his views on race. The effort to impeach Justin Fairfax appears to be on pause for the moment. What exactly is in the Green New Deal? Ilhan Omar is under fire for a new round of comments criticizing Israel. NBC's Alex Seitz-Wald notes that moderate Democrats are seeking a way to own the middle. Taxing the rich has become a defining issue for 2020 Democrats, writes NBC's Benjy Sarlin. Amy Klobuchar made it official. Republican lawmakers are singing Klobuchar's praises. The New York Times has a deep dive into Kamala Harris's effort to define herself amid a reputation for cautiousness. Elizabeth Warren said that Trump "may not even be a free person" by 2020. Is America ready for a single president? Opposition to Trump has created an epic year for women in politics, POLITICO writes. Seth Moultonsays he's "taking a hard look" at a run.